Having played alongside names like David Beckham in the England U21s, former Mansfield Town manager and player Paul Holland seemed to have a glittering future ahead of him. But his career at the very top was always doomed due to knee problems as a youngster and he did well in the end to play as long as he did. As he prepared for his first season in charge at Ilkeston FC, he recalled: “At that time there was an A squad and a B squad for the U21s. “The A squad were playing in a European Championship qualifier over here, which included Robbie Fowler and people like that. “The B squad still had some good players. David Beckham was in there, he was just breaking into the Manchester United team. “But I was struggling even at that time. At 19 I was told to retire though injury. “They said your knees won’t last. If I were a racehorse they’d have put me out to fallow. I wasn’t training properly even in those days. “I was probably having two days off from training and then training one day a week and playing matches. I did that all the way through my career from then. Holland said he always knew his knees would eventually let him down. “I enjoyed my time all the way through football, but it was always going to happen, treading on eggshells and deciding which year or which season it was actually going to end,” he said. “Obviously I was at Bristol City at the time. There was no one near me and the left knee went and 22 operations later you know you’ll never get back. “There was an underlying injury there from a lot of sport as a youngster. “I went with physio Barry Statham and saw a knee specialist in Droitwich in the relegation year, and they told me it was my right knee I was going to have all the problems with, which I did, but ultimately it was my left knee I ended up having to retire with. “I always struggled, even from day to day. I can’t really do any exercise now, I definitely can’t do any running. “Having been an 18-year-old playing England Schoolboys and playing U21s, it’s one of those where you can look back and see where other people have gone. “But I had some great years in football and I have had some great years in coaching. 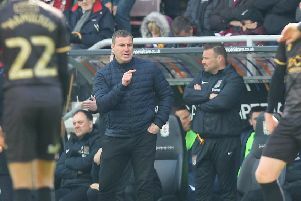 After having his fingers burned in his first managerial role at Mansfield, it’s taken Holland eight years to be lured back into a hot seat, this time at Ilkeston. “I have a massive job here to do,” he said. “ It is a very different model we’re trying to do down here. “It’s all about bringing young players through. I think the average age of the first team towards the end of last season was something just over 18. “Ultimately you know you will lose games with a squad like that, but it’s all about progression and developing those youngsters and giving them the options I had as a youngster. “I have decided I want to bring in five or six more experienced players that will probably be part time who will help them. “When I first started at Mansfield I think there were eight 30-year-olds in that team like Steve Spooner, Gary Ford, and Phil Stant and they made me the player I turned out to be in those two or three years at Mansfield. “If you didn’t do it you’d be pinned up against the dressing room wall. They were great times. I had to knock everyday to go into the home dressing room. “Even though I’d played 43 games that first season, there was no way I’d walk into our home dressing room without knocking. “You had to wait until someone shouted you to come in which you learn a lot of respect from - and that’s definitely gone out of football at the minute. Holland won’t let the hurt he suffered being sacked at Mansfield affect his new role. “You look back on it and you think, yes, decisions were made for certain reasons and you can’t keep keep going on about it and now I need to move forward and hopefully make this a success,” he said. “After I left Mansfield I ended up at Ilkeston in charge of the education and everything. “I was always on record as saying I wasn’t keen on getting back in to it. But I have enjoyed my time at Ilkeston behind the scenes, the opportunity came and it’s in your blood and I can’t wait to get started now. “I did my A-Levels at school, so I enjoyed a couple of years going doing a bit of teaching, then when I had the opportunity to come to Ilkeston and get back involved a little bit on the football side I enjoyed it. He added: “Ilkeston is a brilliantly-run football club and the facilities here are as good as what some lower league football clubs have. “The way I want to do it, I have the 100 per cent backing of everyone and the fans seem happy with what we are trying to do., But the proof is in the pudding when the season actually starts. “It’s different from a lot of non-League clubs. The model we’re trying to do is all about moving young players on back into the Football League.